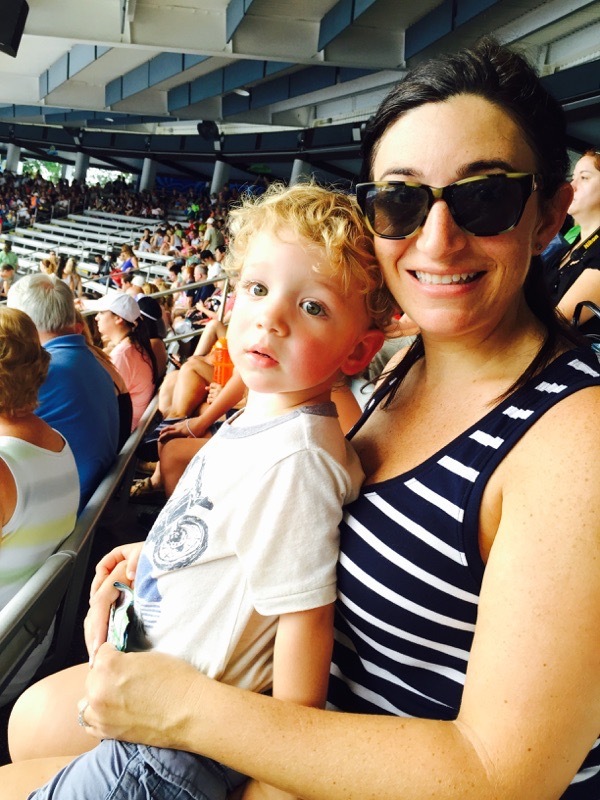 We had a great time visiting Madre in Orlando last week! 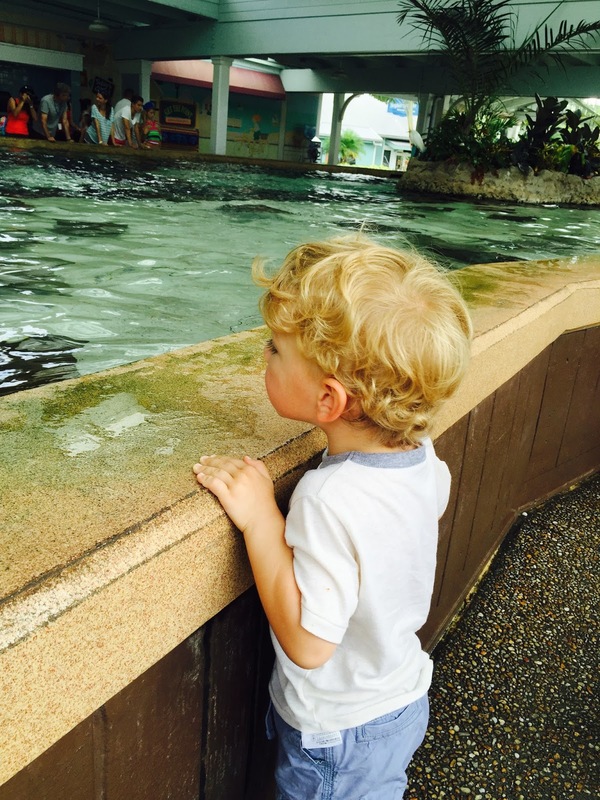 Wyatt is now just over 2 years old, and I thought it would be a great time to introduce him to a place I loved as a child, Sea World. We were armed with our BOB and snacks, ready for a day of fun and toddlerhood. Our first stop was one of my fave things to do when I was younger... touch the sting rays! They are just as slimy as I remembered. Wyatt was intrigued, but didn't want me to put his little hands in there. Then at 10, we went to the first show of the day, the Dolphin show. We arrived about 10 minutes early to the hot stadium. Wyatt was getting ancy as usual, saying done.. done..done. But as soon as the show started he was intrigued! He kept telling the dolphins to jump but they weren't obeying his commands. Then we hopped across to the Turtle Trek, where we saw turtles and some huge manatees! Then went back to get our stroller, and half of Wyatt's snacks had holes in them, ugh. It totally baffled me... then I looked at the other strollers and there was a squirrel rummaging around. That dang squirrel must have been the culprit. I guess it was Wyatt's lucky day because I had to buy some Combos to make up for his damaged goodies. I wish they had a better selection of healthy snacks there for the kiddos. 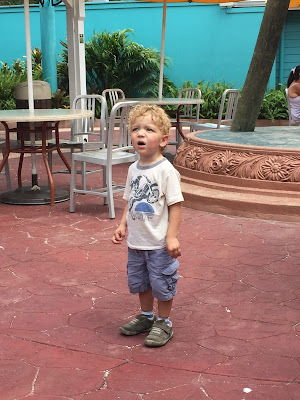 After the show we started walking, and Wyatt became mesmerized by the Journey to Atlantis ride. We spent about 10 minutes watching the boats go down the ride. Too bad this preggo couldn't ride it, grrrr. Then we attempted to see the Penguins, but there was a 30 minute wait. I could just picture Wyatt terrorizing the line with his screams of impatience. So we wandered over to the shark exhibit (and finally got into some a/c). 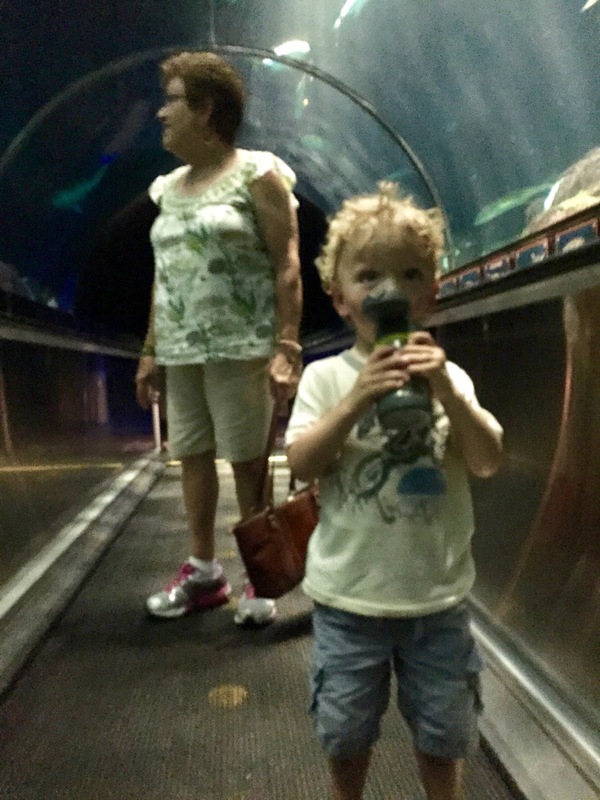 Wyatt loved going on the "escaltoh"! Wyatt was getting a little cranky then fell asleep in the stroller while us 2 adults had lunch. We got burgers at The Spice Mill, nothing to write home about. 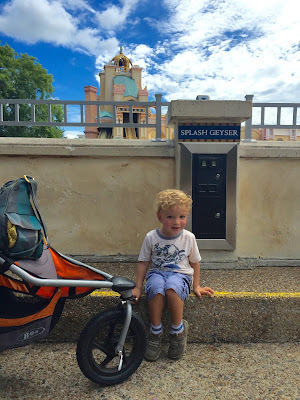 When Wyatt woke up we grabbed a hot dog for him and sat next to one one of the rollercoasters. He loved watching them go by! I think it was his favorite part of the trip. The only place that's really little kid friendly is Shamu's Happy Harbor. They even had a splash pad, I wish I had brought a towel and swim trunks for Wyatt to wear. 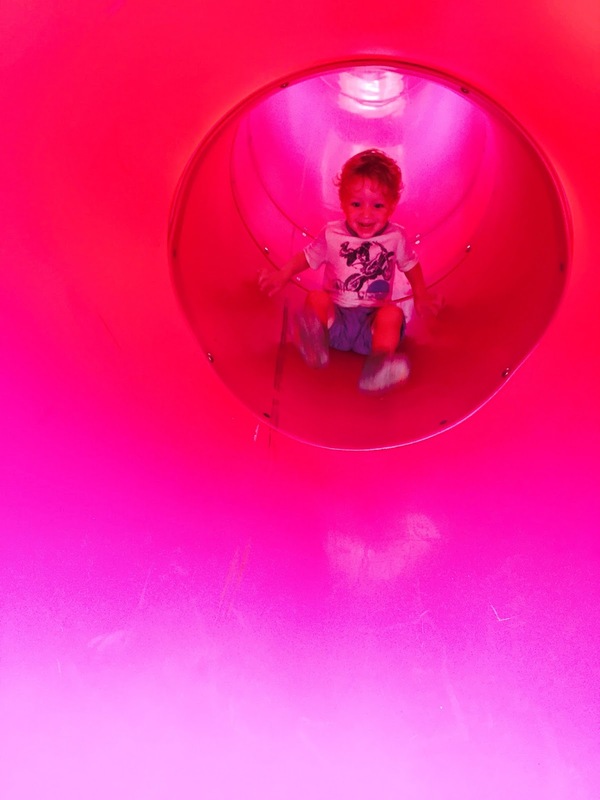 But he really enjoyed the slides. I tried to take him on a few rides, but he freaked out at every single one. I wasn't going to make any more attempts, but he seemed really into the Jazzy Jellies. He said "no cryin" so I decided to give it a go. He had a blast! 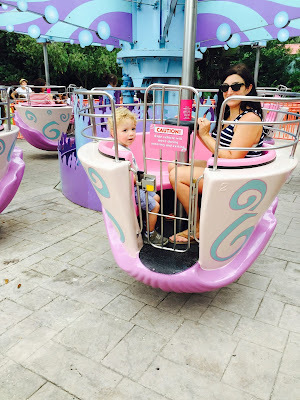 The teacup like ride goes slowly up in the air about 30 feet then comes back down. We went on it 3 times. After the 3rd ride was over we hit the Shamu show. 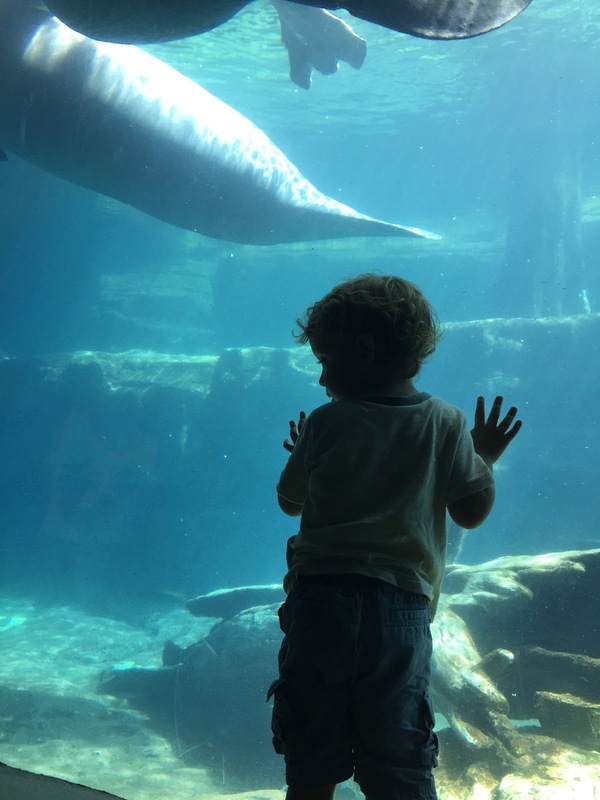 I'm pretty sure he liked the dolphins better.... except for the part where the orcas get some major splashing on at the end. We were all pooped and ready to go home! It was a fun but exhausting day. I think we will attempt to go to Disney World when it's a little cooler. Been to any theme parks lately? I haven't been to a theme park in ages, but really hoping to go to one when I am in the US in a couple of months.